With most of the accusations that Russia rigged the election going nowhere, Clinton supporters continue to concentrate on blaming Russian ads for Hillary Clinton’s loss. 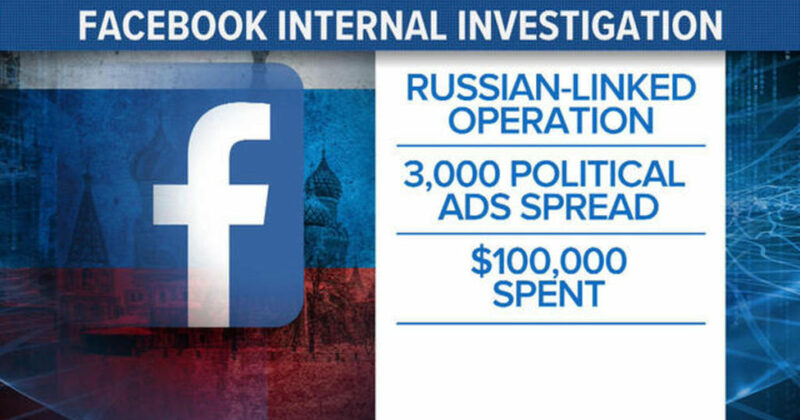 As I’ve previously noted, the actual amount that Russia is accused of spending on Facebook ads is a tiny portion of overall campaign spending–as well as trivial compared to US efforts to intervene in the elections of other nations. As Shattered revealed, Clinton latched onto the idea that others such as Russia were responsible for her loss within twenty-four hours of losing in order to shift the blame away from her for losing a campaign any competent candidate could have easily won. What was in the ads you shared with Congress? How many people saw them? Most of the ads appear to focus on divisive social and political messages across the ideological spectrum, touching on topics from LGBT matters to race issues to immigration to gun rights. A number of them appear to encourage people to follow Pages on these issues. 44% of the ads were seen before the US election on November 8, 2016; 56% were seen after the election. Roughly 25% of the ads were never shown to anyone. That’s because advertising auctions are designed so that ads reach people based on relevance, and certain ads may not reach anyone as a result. For 50% of the ads, less than $3 was spent; for 99% of the ads, less than $1,000 was spent. Shouldn’t you stop foreigners from meddling in US social issues? The right to speak out on global issues that cross borders is an important principle. Organizations such as UNICEF, Oxfam or religious organizations depend on the ability to communicate — and advertise — their views in a wide range of countries. While we may not always agree with the positions of those who would speak on issues here, we believe in their right to do so — just as we believe in the right of Americans to express opinions on issues in other countries. Some of these ads and other content on Facebook appear to sow division in America and other countries at a time of increasing social unrest. If these ads or content were placed or posted authentically, you would allow many of these. Why? This is an issue we have debated a great deal. We understand that Facebook has become an important platform for social and political expression in the US and around the world. We are focused on developing greater safeguards against malicious interference in elections and strengthening our advertising policies and enforcement to prevent abuse. As an increasingly important and widespread platform for political and social expression, we at Facebook — and all of us — must also take seriously the crucial place that free political speech occupies around the world in protecting democracy and the rights of those who are in the minority, who are oppressed or who have views that are not held by the majority or those in power. Even when we have taken all steps to control abuse, there will be political and social content that will appear on our platform that people will find objectionable, and that we will find objectionable. We permit these messages because we share the values of free speech — that when the right to speech is censored or restricted for any of us, it diminishes the rights to speech for all of us, and that when people have the right and opportunity to engage in free and full political expression, over time, they will move forward, not backwards, in promoting democracy and the rights of all. Nobody has offered a meaningful explanation as to how this ad buy could have had a more important role in determining the election results than the far larger efforts by the candidates and their US supporters, including the paid trolls used by the Clinton campaign on social media. Those who did see these Facebook ads undoubtedly saw many, many more ads from other sources. It is also doubtful that having a Facebook ad appearing on one’s news feed is going to change one’s vote. It is also worth considering that Russia did have legitimate concerns regarding the outcome of the US election. The Democratic candidate (who received the nomination due to a quite undemocratic system which was little different from choosing the nominee in the proverbial smoked-filled rooms), was one of the most hawkish candidates to run for political office to recent years, with many of her neocon allies supporting regime change in Russia similar to the regime change Clinton has backed in other countries. She has a long history of belligerence towards Russia, along with a history of meddling in Russia’s election when Putin was a candidate. Russia (as did many American voters) had good reason to believe that the election of Clinton would lead to a restoration of cold war style hostilities at very least, with direct military conflict a very real possibility.